The multi-band inverted vee I had on the previous house-bracketed mast worked well and served my purposes at the time. Since then my interests and objectives have changed. The inverted vee still serves an important purpose in my station but one that requires changes. The new and improved antenna mast was the first step. The time had come for a more permanent and robust structure. The antenna came next, with changes both to its operating characteristics and its mechanical design. Both were small changes and were quickly put into effect once the weather improved. It has been very wet here recently. The antenna is up in the air for testing and tuning, almost but not quite ready for the fall season. In the past year my operating objectives have changed. My original plan of low-impact QRP operation put the inverted vee in the spotlight as key element of my antenna plan. It included elements for 30, 20, 17 and 15 meters, and also worked well on 10 meters. Its apex at 14.3 meters was higher than the multi-band dipole for 20, 17, 15 and 10 meters, so it not only did better on some longer path DX it filled the nulls in the dipole's pattern. It was also my only antenna for 30 meters. DXing and QRP remain as objectives for the immediate future. At least that hasn't changed. But now that I've returned to contest operating and put up the new tower the purpose of the inverted vee has changed. Short path 40 meters: The delta loop was a great antenna for DXing but not so good for working short paths. Contesting requires an antenna with more high-angle radiation for this band. Diversity: The planned tri-band yagi on the 15 meters high tower will be a boon for QRP DX and contests. That benefit comes with disadvantages. In particular the F/B, F/S and the time to swing the yagi around to work perhaps just one or a few stations. The inverted vee will allow the ability to hear, then quickly call and hopefully work a rare DX station or contest multiplier. Reliability: The inverted vee has to survive normal wear-and-tear and weather events. The old antenna was prone to problems that required maintenance and repair. The 15 meters elements was extended to make it a 40 meters element. That's it; no other changes were made. Even so there are implications. The 40 meters element length was modelled in EZNEC beforehand since the wire is insulated and the interior angle and height impact on the resonant frequency. This calculated to 10.2 meters per side, and that is how I cut it. From previous modelling and experimentation I found that the longest element in a fan dipole of this type (multi-wire cage) is least affected by the shorter elements. This didn't quite work out since the resonant frequency is close to 6.9 MHz, or nearly 3% below 7.1 MHz. I'll have to trim it to improve the SWR in the SSB segment. Problems were expected for the other elements since they all must now contend with an additional adjacent wire at their ends, which is the situation that most impacts tuning. This is just what I found on 20 and 17 meters, with both antennas having their resonant frequencies reduced by about 1.5%. Interestingly this did not happen on 30 meters (formerly the longest element), where the SWR stayed put at almost exactly 1. I have not yet trimmed the antenna yet since I want to "test drive" it for a few days to determine its performance. An SWR of 1.5 on the CW segment of 20 and 2.5 on 17 is good enough to allow testing. Somewhat troubling is that even at resonance (17.9 MHz) the SWR of 1.9 is higher than I'd like. However since the rig isn't complaining I may just trim the antenna and then leave it be. The situation on 15 meters is more interesting. I expected a problem since a 40 meters dipole typically resonates quite a bit higher than simply 3x the fundamental frequency. 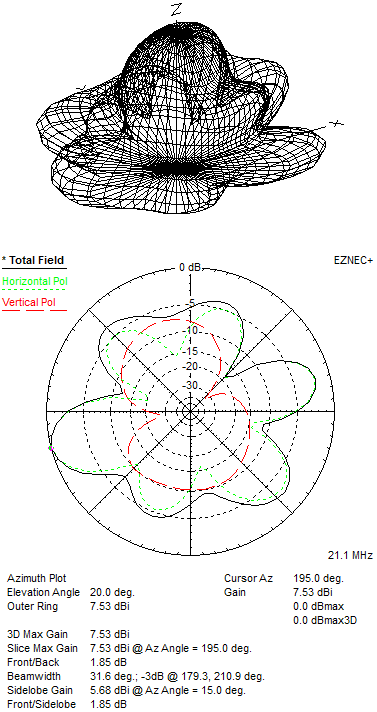 The standalone EZNEC model (mentioned above) showed resonance around 21.4 MHz for a fundamental at 7.05 MHz. With the resonant frequency lower than planned the 15 meters resonant frequency is 21.1 MHz (SWR 1.7). I measured the antenna below the band edge to get an idea how the SWR would behave after I trim the 40 meters element. It will be acceptable but not ideal for the CW segment. To better understand this antenna I may take the trouble to modelling it in EZNEC. It may be difficult because of the closely-spaced wire. In any case I don't have the time for that now. The bulk of the improvement to the antenna is its mechanical. This may not be obvious in the picture above so I'll step through what I did. Insulators: Tying the ends of each element with nylon rope was expedient at the time but not a great idea. Precipitation would wet the rope and cause the resonant frequency on all bands to drop quite dramatically. Since I still need the antenna to be light I made a pile of insulators from the same PVC pipe I used to make the X-spreaders for the cage. (That may be the best $3 I have ever spent.) As you can see in the picture they are simple and ugly, but they work. When it rains I'll know for sure. 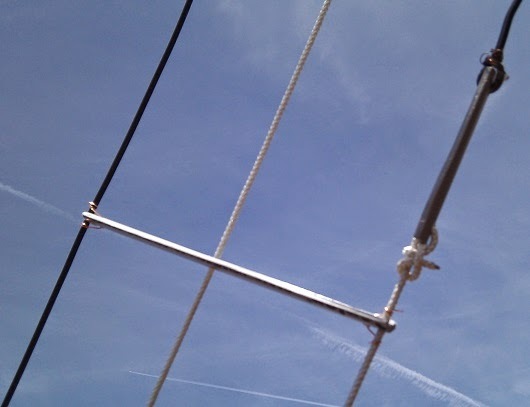 Wire ties: The wires and ropes were held in notches at the ends of the X-spreaders by friction alone. They sometimes popped out in the wind or when the antenna was lifted and lowered. I also had the problem of the spreaders leaning over in the places where the friction was insufficient to securely hold all the wires and ropes. I solved this by drilling small holes just below every notch in every spreader, sliding an AWG 22 wire through the hole and wrapping it around the wire element (or rope) on both sides of the spreader (I have lots of surplus telephone quad cable). The picture shows how this looks (along with an insulator) at the north end of the 30 meters element. Rope routing: The 30 meters element and the ropes holding the other element ends in the first version all tied back to a steel ring (flat washer). The ropes had a habit of twisting and tangling. I simplified the structure and made it stronger. The 20 meters element ties to the rope holding the 17 meters element so that it doesn't have to be any longer. That longer rope passes through the centre hole in the I-spreader for the 30 and 40 meters element (one half of an X-spreader, as pictured immediately above) to a short spreader near the end of the 40 meters element. Result: no tangling and all inter-element distances are held consistent. Ropes for the shorter wires can be correctly tensioned provided that the 40 meters element is held taut. Spreader spacing: I had been careless with placement of the spreaders. This causes additional sag in some places. In this version the distance between X-spreaders is held consistent at 2.3 meters (93"). The position of the new I-spreaders was placed at the end of the 30 meters element to best manage consistent element spacing. The result was impressive. 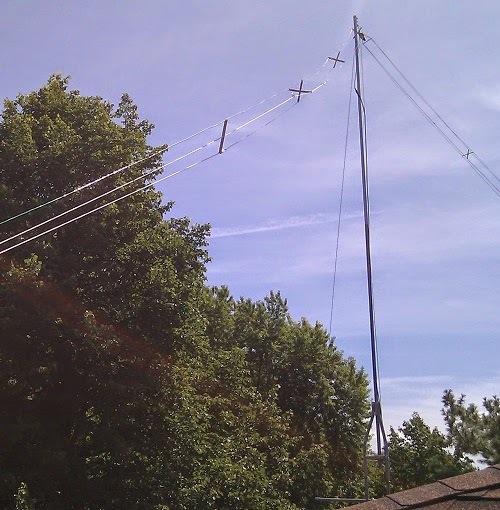 When I finished construction I was able to drag the antenna across the yard, lift it by attaching the centre insulator to my climbing harness, and then winch it to the top of the mast without a single wire or spreader moving out of place through all of this abuse. The few tangles were unravelled by simply pulling on the ropes holding the ends of the element halves. In other words, I seem to have gotten it right this time. After finishing the antenna raising just before sunset on Sunday evening I ran the coax into the shack and confirmed that the antenna worked on all bands. It did, with the caveats about tuning mentioned earlier. I then proceeded to put it on the air and make some CW DX contacts. I hope it is an omen that my very first QSO was with JT1AA/5 on 17 meters for my QRP DXCC country #202. He was weak here and I expect my 10 watt signal was much weaker there. He needed some time to copy my call correctly. I then moved to other bands, working DX on 20, 30 and 40 meters without any real difficulty. I didn't work anything on 15 but I did hear a weak A35 working a stateside pile-up. With that out of the way I sat down with the EZNEC model of the 40 meters element and had a closer look. Notice that the radiation is mainly horizontal broadside and vertical off the sides. This is expected from an inverted vee. The pattern is not much worse than a vertically-polarized delta loop with regard to omnidirectionality. Its elevation pattern is, not surprisingly, worse. However the difference is no worse than -2 db at 10° elevation. The good news is that the gain is higher where short-path communication should peak. 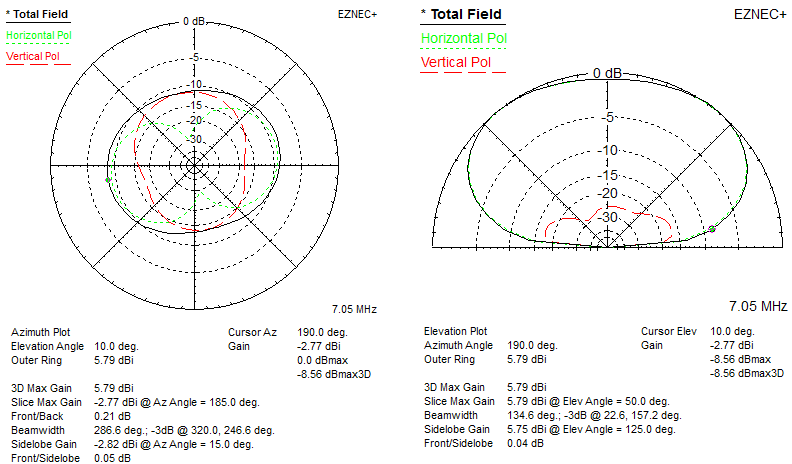 It will be interesting to do a side-by-side comparison to a vertically-polarized 40 meters antenna this fall. I may put up the delta loop again if the interactions with the tower and yagi are managable. The only other band I will discuss for now is 15 meters. That's a special case since its length is 3λ/2. The other bands are mostly uninteresting. Not unexpectedly the pattern on 15 is a mess. A long antenna like this has multiple lobes and nulls. You can see the complexity in the 3D plot. If you look at the azimuth pattern at 20° elevation (where maximum gain is located) and tilt your head left it looks a bit like a gingerbread man. While this is not what a reasonable person would call omnidirectional it is close enough to serve that purpose for my stated objective of directional diversity. The elevation pattern shows more gain at high angles than I'd like since it's wasted. So, not great but it'll do for now. Since the antenna is tied on the south end to the new tower the 40 meters element crosses the upper guy wire. The distance between them is less than 2 meters. That 26' (7.9 m) guy section is resonant on 17 meters but not at all on 40. Since they cross at nearly a right angle interaction ought to be small. Initial operation of the antenna on 40 tells me that there is no significant impact. Interaction modelling could prove useful in this instance. That and interactions with tower-mounted antennas is a task yet to be done. That and more is planned for my interaction model. It should be interesting. Addendum (August 20): The antenna has now been tuned. Fan dipoles, even in cage form, are strange beasts when it comes to element interactions and tuning. First I trimmed one side of the 40 meters element by 1% (20 cm), adjusted the ropes and raised it back in the air to see what would change. Resonance moved from 6.9 MHz to 7.05, MHz, which is a 2% change. This is close enough to what I wanted that I decided to leave it be. None of the other bands were affected by this trimming. Okay, 15 meters did change since it utilizes the 3rd harmonic of this element. Resonance there increased to 21.25 MHz, and the SWR is a little above 2 at the bottom of the band. Next I trimmed the 20 and 17 meters elements (30 meters was already perfectly tuned) from the same side. This is the side where I had added lengths of wire while tuning the original version of the antenna last year. 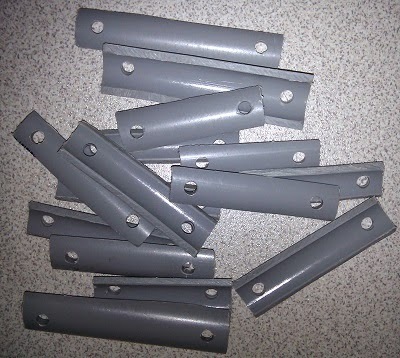 I cut 12 cm off the 20 meters half-element and 10 cm off the 17 meters half-element. This is less than I calculated to raise resonance from 13.9 to 14.1 MHz and from 17.9 to 18.1 MHz. I was being cautious. Again I adjusted the ropes and raised the antenna for testing. The 20 meters resonant frequency moved up to 14.075 MHz and on 17 meters to 18.15 MHz. Both bands showed a higher Q (smaller SWR bandwidth) than an individual dipole for either band would have. Also interesting is that the SWR at resonance on 17 meters improved from 1.9 to 1.5. While the SWR at 14.3 MHz and 18.068 MHz is higher than I'd ideally like the antenna works well and the rig doesn't complain. At this point I decided to step away from further tinkering. The SWR curves are good but not perfect on a few bands. In consideration of the extensive interactions among elements I suspect that further tuning could prove frustrating.